Learn How to analyze text using NLTK. Analyze people's sentiments and classify movie reviews. In today's area of internet and online services, data is generating at incredible speed and amount. Generally, Data analyst, engineer, and scientists are handling relational or tabular data. These tabular data columns have either numerical or categorical data. Generated data has a variety of structures such as text, image, audio, and video. Online activities such as articles, website text, blog posts, social media posts are generating unstructured textual data. Corporate and business need to analyze textual data to understand customer activities, opinion, and feedback to successfully derive their business. To compete with big textual data, text analytics is evolving at a faster rate than ever before. Text Analytics has lots of applications in today's online world. By analyzing tweets on Twitter, we can find trending news and peoples reaction on a particular event. Amazon can understand user feedback or review on the specific product. BookMyShow can discover people's opinion about the movie. Youtube can also analyze and understand peoples viewpoints on a video. Text communication is one of the most popular forms of day to day conversion. We chat, message, tweet, share status, email, write blogs, share opinion and feedback in our daily routine. All of these activities are generating text in a significant amount, which is unstructured in nature. I this area of the online marketplace and social media, It is essential to analyze vast quantities of data, to understand peoples opinion. NLP enables the computer to interact with humans in a natural manner. It helps the computer to understand the human language and derive meaning from it. NLP is applicable in several problematic from speech recognition, language translation, classifying documents to information extraction. Analyzing movie review is one of the classic examples to demonstrate a simple NLP Bag-of-words model, on movie reviews. Text mining also referred to as text analytics. Text mining is a process of exploring sizeable textual data and find patterns. Text Mining process the text itself, while NLP process with the underlying metadata. Finding frequency counts of words, length of the sentence, presence/absence of specific words is known as text mining. 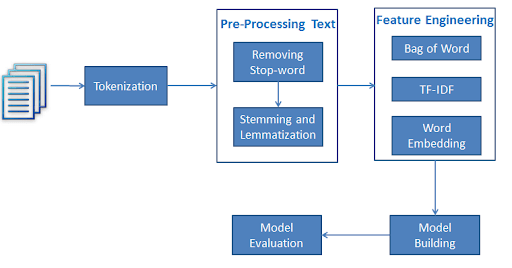 Natural language processing is one of the components of text mining. NLP helps identified sentiment, finding entities in the sentence, and category of blog/article. Text mining is preprocessed data for text analytics. In Text Analytics, statistical and machine learning algorithm used to classify information. NLTK is a powerful Python package that provides a set of diverse natural languages algorithms. It is free, opensource, easy to use, large community, and well documented. NLTK consists of the most common algorithms such as tokenizing, part-of-speech tagging, stemming, sentiment analysis, topic segmentation, and named entity recognition. NLTK helps the computer to analysis, preprocess, and understand the written text. [33mYou are using pip version 9.0.1, however version 10.0.1 is available. Tokenization is the first step in text analytics. The process of breaking down a text paragraph into smaller chunks such as words or sentence is called Tokenization. Token is a single entity that is building blocks for sentence or paragraph. Sentence tokenizer breaks text paragraph into sentences. text="""Hello Mr. Smith, how are you doing today? The weather is great, and city is awesome. The sky is pinkish-blue. You shouldn't eat cardboard"""
Here, the given text is tokenized into sentences. Word tokenizer breaks text paragraph into words. Stopwords considered as noise in the text. Text may contain stop words such as is, am, are, this, a, an, the, etc. In NLTK for removing stopwords, you need to create a list of stopwords and filter out your list of tokens from these words. Lexicon normalization considers another type of noise in the text. For example, connection, connected, connecting word reduce to a common word "connect". It reduces derivationally related forms of a word to a common root word. Stemming is a process of linguistic normalization, which reduces words to their word root word or chops off the derivational affixes. For example, connection, connected, connecting word reduce to a common word "connect". Lemmatization reduces words to their base word, which is linguistically correct lemmas. It transforms root word with the use of vocabulary and morphological analysis. Lemmatization is usually more sophisticated than stemming. Stemmer works on an individual word without knowledge of the context. For example, The word "better" has "good" as its lemma. This thing will miss by stemming because it requires a dictionary look-up. The primary target of Part-of-Speech(POS) tagging is to identify the grammatical group of a given word. Whether it is a NOUN, PRONOUN, ADJECTIVE, VERB, ADVERBS, etc. based on the context. POS Tagging looks for relationships within the sentence and assigns a corresponding tag to the word. sent = "Albert Einstein was born in Ulm, Germany in 1879." POS tagged: Albert/NNP Einstein/NNP was/VBD born/VBN in/IN Ulm/NNP ,/, Germany/NNP in/IN 1879/CD ./. Nowadays companies want to understand, what went wrong with their latest products? What users and the general public think about the latest feature? You can quantify such information with reasonable accuracy using sentiment analysis. Quantifying users content, idea, belief, and opinion is known as sentiment analysis. User's online post, blogs, tweets, feedback of product helps business people to the target audience and innovate in products and services. Sentiment analysis helps in understanding people in a better and more accurate way. It is not only limited to marketing, but it can also be utilized in politics, research, and security. Human communication just not limited to words, it is more than words. Sentiments are combination words, tone, and writing style. As a data analyst, It is more important to understand our sentiments, what it really means? There are mainly two approaches for performing sentiment analysis. 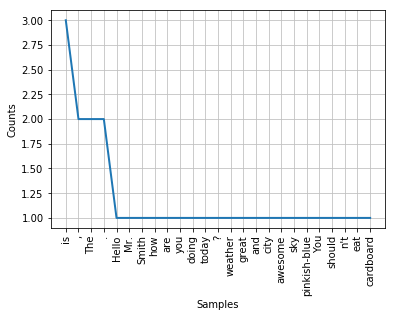 Lexicon-based: count number of positive and negative words in given text and the larger count will be the sentiment of text. Machine learning based approach: Develop a classification model, which is trained using the pre-labeled dataset of positive, negative, and neutral. In this Tutorial, you will use the second approach(Machine learning based approach). This is how you learn sentiment and text classification with a single example. Text classification is one of the important tasks of text mining. It is a supervised approach. Identifying category or class of given text such as a blog, book, web page, news articles, and tweets. It has various application in today's computer world such as spam detection, task categorization in CRM services, categorizing products on E-retailer websites, classifying the content of websites for a search engine, sentiments of customer feedback, etc. In the next section, you will learn how you can do text classification in python. Till now, you have learned data pre-processing using NLTK. Now, you will learn Text Classification. You will perform Multi-Nomial Naive Bayes Classification using scikit-learn. In the model the building part, you can use the "Sentiment Analysis of Movie, Reviews" dataset available on Kaggle. The dataset is a tab-separated file. Dataset has four columns PhraseId, SentenceId, Phrase, and Sentiment. In the Text Classification Problem, we have a set of texts and their respective labels. But we directly can't use text for our model. You need to convert these text into some numbers or vectors of numbers. Bag-of-words model(BoW ) is the simplest way of extracting features from the text. BoW converts text into the matrix of occurrence of words within a document. This model concerns about whether given words occurred or not in the document. Doc 1: I love dogs. Doc 2: I hate dogs and knitting. Doc 3: Knitting is my hobby and passion. Now, you can create a matrix of document and words by counting the occurrence of words in the given document. This matrix is known as Document-Term Matrix(DTM). This matrix is using a single word. It can be a combination of two or more words, which is called a bigram or trigram model and the general approach is called the n-gram model. You can generate document term matrix by using scikit-learn's CountVectorizer. Let's split dataset by using function train_test_split(). You need to pass basically 3 parameters features, target, and test_set size. Additionally, you can use random_state to select records randomly. Let's build the Text Classification Model using TF-IDF. First, import the MultinomialNB module and create a Multinomial Naive Bayes classifier object using MultinomialNB() function. Then, fit your model on a train set using fit() and perform prediction on the test set using predict(). Well, you got a classification rate of 60.49% using CountVector(or BoW), which is not considered as good accuracy. We need to improve this. In Term Frequency(TF), you just count the number of words occurred in each document. The main issue with this Term Frequency is that it will give more weight to longer documents. Term frequency is basically the output of the BoW model. IDF(Inverse Document Frequency) measures the amount of information a given word provides across the document. IDF is the logarithmically scaled inverse ratio of the number of documents that contain the word and the total number of documents. TF-IDF(Term Frequency-Inverse Document Frequency) normalizes the document term matrix. It is the product of TF and IDF. Word with high tf-idf in a document, it is most of the times occurred in given documents and must be absent in the other documents. So the words must be a signature word. First, import the MultinomialNB module and create the Multinomial Naive Bayes classifier object using MultinomialNB() function. Well, you got a classification rate of 58.65% using TF-IDF features, which is not considered as good accuracy. We need to improve the accuracy by using some other preprocessing or feature engineering. Let's suggest in comment box some approach for accuracy improvement. In this tutorial, you have learned what Text Analytics is, NLP and text mining, basics of text analytics operations using NLTK such as Tokenization, Normalization, Stemming, Lemmatization and POS tagging. 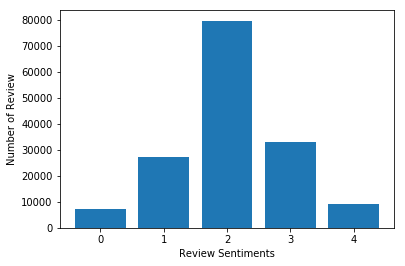 What are sentiment analysis and text classification using scikit-learn? I look forward to hearing any feedback or questions. You can ask the question by leaving a comment, and I will try my best to answer it. If you are interested in learning more about Python, please take DataCamp's Natural Language Processing Fundamentals in Python course.